Click to buy a Personal License: Only 14.99 EURO / 16.99 USD! (for home/personal use, ex. VAT). Click to buy a Professional License 39.99 EURO (ex. VAT) – If using JPG-Repair Toolkit to provide repair services to others. Use the trial version to determine if JPEG Repair Toolkit can repair your photo(s) prior to purchasing. JPG-Repair is an easy to use alternative for replacing corrupted headers with a hex editor. JPG-Repair can repair corrupt JPEG headers using a reference or sample file. It is an easy alternative for replacing a corrupt header with an intact one using a hex editor. A typical symptom of a corrupt header is that the JPEG file can not be opened at all. 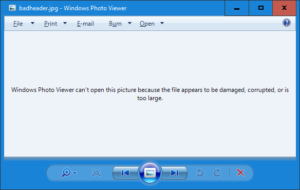 Windows explorer does not show preview thumbnails and different viewers and photo editors may show different error messages. JPG-Repair can even get the JPEG data from RAW files (functionality previously found in JpegDigger) such as Canon CR2 and Nikon NEF files when ‘normal’ tools that are normally up to this job can not. Depending on the camera manufacturer those JPEGs are full resolution JPEG files. Are RAW photos from you camera not supported? Send me a few samples and I’ll add support for those as quickly as possible! My aim is to support every RAW format out there! JPEG Repair Toolkit extracts embedded JPEGs as they are. If embedded JPEGs are corrupt themselves then extracted JPEGs are too. In some cases JPEG-Repair Toolkit may be able to repair these JPEGs. Most of the simpler repairs only require you to select the file(s) you need to repair and click ‘repair’. For repairing corrupted headers JPG-Repair needs a ‘sample file’. The reference or sample file should be taken with the same camera as the corrupt image(s). Also, the settings (resolution, quality and orientation) of the sample file need to match the corrupt files. If unknown then you would need to experiment by taking different shots with different settings using the original camera (same brand and type). 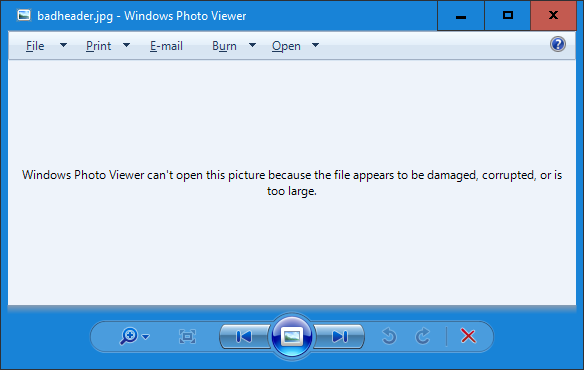 Windows photo viewer doesn’t like this file! The result of a corrupt JPEG header. Technically JPG-Repair does not repair these files. Functionality is limited to extracting half or full sized JPEGs from these file types. However, JPG-Repair is able to process RAW corrupt files while other tools able to extract JPEG from RAW often rely on the file to be intact. And that’s what I do it for! See this when running JPGRepair? 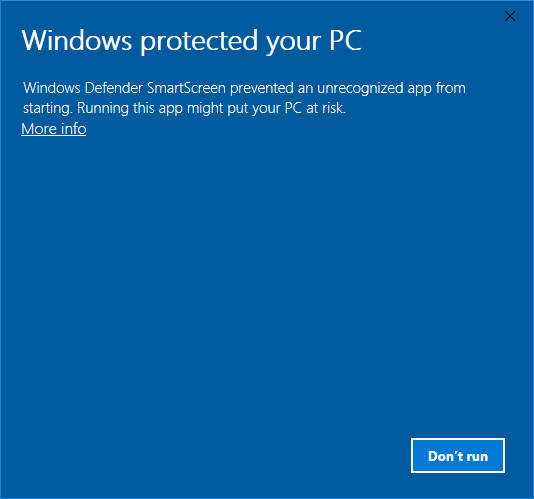 It means I have recently updated the software and SmartScreen doesn’t recognize it yet. Click More info > Run anyway. To determine signatures I examined RAW files taken from: http://www.rawsamples.ch/index.php/en/canon. If you have other issues then feel free to contact me. Send me your sample file + some corrupted files so I can examine them. i have a question, i have maybe the problem with wrong header of sample, how could i find, that i have correct one or how could i change to correct one? 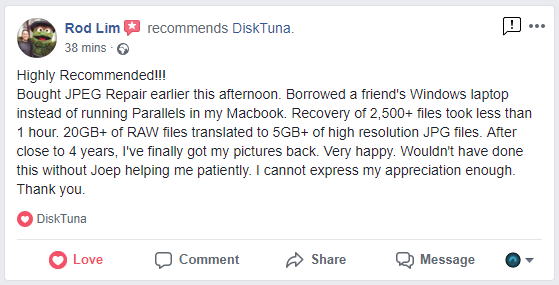 Can you send me the damaged file (joep@disktuna.com)? Can you try in English please? I have no idea what you’re saying, sorry. Could you be so kind to send (email joep@disktuna.com) me the sample + a few of the corrupt files so I can look into it? That is possible. A good part of the files that people send to me are beyond repair. If that’s the case with your files or not I can not tell without looking at them. 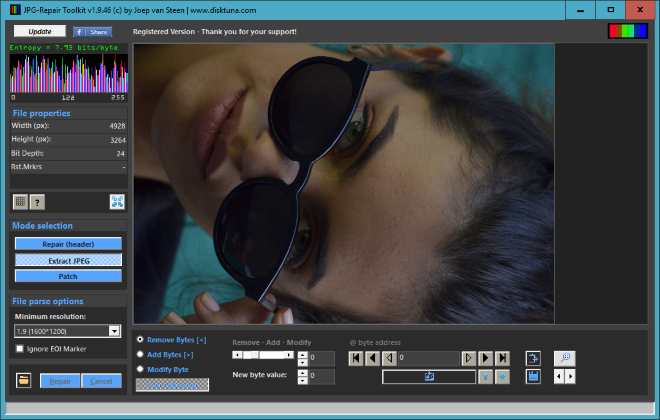 So feel free to send a few + a known good sample shot with the same camera and settings (joep@disktuna.com). Yes, received in good order. I’ll email back after looking at them, okay? Okay .. Can you give me access to the entire google drive folder please so that I do not have to download files one by one? Hello. I just downloaded this program in hopes of repairing some jpgs that I recently payed someone a lot of money to recover from a damaged external hard drive only to now find most of the files are now corrupted for some reason. I feel like crying. Anyway, I feel dumb asking but how do i provide a sample? I have an uncorrupted sample taken by the same camera with same resolution and quality and orientation. Luckily there are a few that were not corrupted. These are files taken years ago and I no longer have the camera. Thanks for any help you can give. Have a look at the video at then end of this page: https://www.disktuna.com/repair-corrupt-jpeg-header/. Basically, all you need is an intact file shot with the same camera > copy in same folder as the corrupt files > rename this file to sample.jpg. Actually I think I figured out how to add the sample photo and then the corrupt one but nothing has happened to any corrupt file I have tried. I only tried a couple. Can you send me those + a sample so I can check if they’re fixable at all? Hello I sent a sample of a corrupt image file to your address. Pls check for. Me if I can recover this. It’s really urgent pls. I’d appreciate your response. Thanks. You sent me .NEF files and a .JPG sample. So did you intend to sent me JPEGs? The NEF files only contain zeros, so no data at all I’m afraid. Hello I am very Naga from Indonesia, I am very grateful to this software, because the jpeg file that is damaged in half gray has my friend (a traveler from France) can be solved by this software. This software is highly recommended for those of you who are having jpeg files that are problematic, such as: corrupted jpeg file, half ashes jpeg file, jpeg file that is completely unreadable and other problems. Hi how do i figure out what resolution my corrupted photos are to find a sample to match? All the corrupted files so far are showing as -1 x -1 does this mean they are beyond repair? How do you get the free Key for liking on Facebook? Your program works! The demo mode showed me a recovered file. Oh good that it works for you! Maybe leave a nice review then where ever you found the program? If you click the like button here on this page, it will immediately show a serial number for you. So, click the little FB thumbs up where it says “like us .. only this weekend”. I just got JPG-Repair Toolkit from Giveawayoftheday and it appears that I need access to the internet just to start the program. You mean there is a problem if you don’t allow it access? because it should not be a problem if you have no access. All it does is ‘touch’ a page on my website so I get some idea of how many times it is run. That’s not how this should work. I will fix it. Thanks for reporting it. Could you be so kind to check for me if it works ok now? Because internet or not, you should be able to run it. So, I just uploaded 1.9.2. My corrupted Nikon NEF files are often the ones with adjustment settings from CNX2 saved into the NEF file. Is there a way to recover the full NEF file with or without the adjustments ? I tried several raw editors, neither of them wants to open those edited NEF files, they just show up as corrupted. I tried your free version of jpegrepair to see if I could recover a jpeg file from these corrupted NEF files, it works but still shows 20% of the image as corrupted. Is there a way to recover the whole picture ? thank you so much. TBH I have no idea how CNX2 saves those settings. If they embedded with the JPEG too then that should be possible. Currently JPG-Repair strips that from the header (if it would be stored in the JPEG header), but I would need to see if I can make it so that it leaves that info untouched. What happened to the NEF files, do you have an idea? As you speak of ‘recover’ rather than repair, were they lost/deleted? If extracted JPEGs are corrupt then it depends if that is repairable, it should be treated like any corrupt JPEG. they were partially recovered from a harddrive that crashed but all the non edited NEF files seem to work perfect. The ones that were previously edited and seved with CNX2 dont work anymore but info is definitively still in the file. Other editors actually save the extra data into another folder, which is better to leave the NEF files intact. Okay, I think I fixed the Photo Heal error. It never occurred on my PC, so I only know for sure if you try it too. Okay, so files were result of file recovery. That is always tricky because most common cause for files to be corrupt is then that they’re recovered incorrectly. I will now look at your files asap. Unfortunately it appears FILE0006.NEF is simply incorrectly recovered and does not contain the data the original file presumably did. The JPEG is simply prematurely cut off and is followed by NON JPEG data. Better said is, it is interrupted by non JPEG data The same goes for NEF data itself. The header appears okay, it’s the sensor data itself. – How did the hard disk crash? – Do you happen to know the file system, like NTFS? – What software was used to recover the data? File names suggest files are a result of file signature based scan. If the file system was NTFS, in general much better results are achieved with software tat virtually reconstructs the file system. – Has the hard disk been used since? I’ve been unable to make it work. Adding bytes seems to have no effect at all on the picture. Of course I have no idea what you’re talking about without looking at the picture. Adding bytes where? To accomplish what? Adding bytes works in the trial BTW. Trial limitation is that is saves scaled down pictures in BMP format. I looked at the file and there is nothing ‘jpeggy’ in there which explains the no SOS detected. And also if you look at the value for entropy (8 bits/byte) then it is indeed likely the file is encrypted. It is like an object needing repair like a car is in an unbreakable vault . As long as it is in there the guy who normally can repair it ca not reach it. So this is not something I or any JPEG repair software can help with. I transferred roughly 3000 images from my phone to my computer because my phone was running out if space. I then deleted my photos from my phone (I don’t have backup cloud or anything like that). I went on my computer to see that all 3000 photos and videos were “corrupted” or could not be opened. 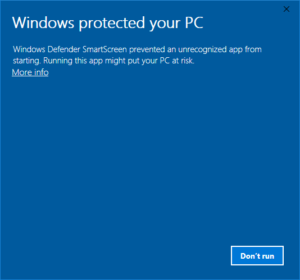 Will this help restore at least the photos in my computer even if they have never been viewable on the pc? Can’t tell without looking at a few. I hope you did not expect a yes or no answer to this type of question. I have tried many different so called jpeg repair programs and thus far all have failed to repair the photo file. I do have a number of corrupt files but by chance some from the batch have not corrupted thus perhaps this would indicate the depth of corruption when both jpeg files are compared. I am at a loss how the corruption happened other than it occurred when I transferred them from an old computer to a an external hard drive. Yes, you would need to send me a few of the corrupted files + some intact samples.